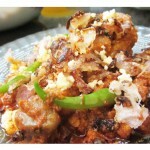 Chicken roll is one of the popular street-food originated from Kolkata. That’s why it is often called the “Calcutta Roll”. This is a roll where Juicy morsels of spicy chicken are wrapped in Paratha that has been coated with egg! So it has two basic parts. One is making paratha and another is inner chicken stuffing. Once they are ready, all you need to do is assemble the rolls and serve! 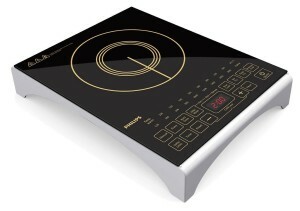 Philips introduces a beautiful induction cooktop. It has sleek and sturdy glass panel cooktop for convenient and fast cooking. I’m loving it. You can buy it from amazon. Marinade the chicken cubes. Add salt, lime juice, whipped yogurt, turmeric powder, red chili powder, tandoori chicken masala, mustard oil, chopped green chilies and ginger garlic paste over the chicken pieces and rub altogether. 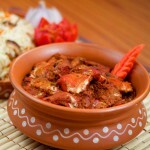 I have added tandoori chicken masala because I want to keep the recipe as simple as that. 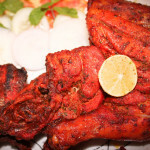 This tandoori masala has a unique combination of all aromatic spices which we need for this recipe. 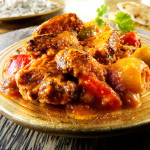 So you don’t need put eextra effort of adding cumin, coriander and other masala powders separately and this masala will really give a nice taste like kebab. Also add the chopped coriander leaves and mix well again. Marinate for at least 30 minutes. While chicken is resting, let’s make the dough for paratha. You can go ahead with plain paratha but my first choice for this roll is lachcha paratha because it is more crispier and flaky paratha and tastes just awesome. The dough needs very basic ingredients. plain flour, salt, sugar, oil and enough water. Knead to get a smooth dough. Divide into equal roundels or balls. The roundels will be slightly bigger than normal roti roundels. Roll into big circle. Then apply a tsp of oil evenly on the top. either use your hands or a brush to spread. Sprinkle a tsp of flour and again spread evenly. Now start making fleets. After fully done, twist and coil (roll) to make a flat round. Rest for 30 minutes in the refrigerator. In the meantime, lets cook the chicken. Take a pan and heat 2 tbsp oil. Once the oil is hot, add onions and saute. When they are golden brown in color, add marinated chicken. Give a good saute to incorporate altogether. Cover and cook. After 4-5 minutes of cooking on slow flame, the chicken will leave its own juices. So you don’t need to add water as They will cook with these juices. At the end of cooking add onion rings and capsicum. Give a final saute and take out. I have added them at the end of cooking because I want them little bit cooked but still get a crunch.Chicken filling is done. Now just roll the paratha but be careful this time as too much pressure can remove the layers. Place the paratha on the heated pan. Beat the egg well with a little salt and keep aside. Apply oil on the paratha. When one side is fully cooked and other side is halfway remove from the pan. Add oil again on the tawa and Pour beaten egg. Spread by tilting the pan from side to side. Now quickly put a Paratha onto the still ‘wet’ egg (the less cooked side should be up)and allow to cook. Press to cook inside. The egg will soon cook and ‘set’. Flip the parantha over to the other side (egg side up) and cook till both sides are evenly fried. Vegetarian can skip this step and put the stuffing directly in paratha. Remove the fried parantha from tawa . Keep aside. Place a tissue paper or foil on a serving plate and then place the parantha (egg side should be up) and lay a portion of the cooked chicken pieces in a straight line in the middle of the parantha. PUT sliced onions, cucumber, chopped green chillies on the chicken cubes. Add tomato sauce and sprinkle chat masala. Finally squeeze the lime juice. Roll the parantha with the chicken stuffing firmly so that the chicken cubes do not fall. Can not wait to try this, my chicken is brewing, wondering if I should make a cucumber riata ?